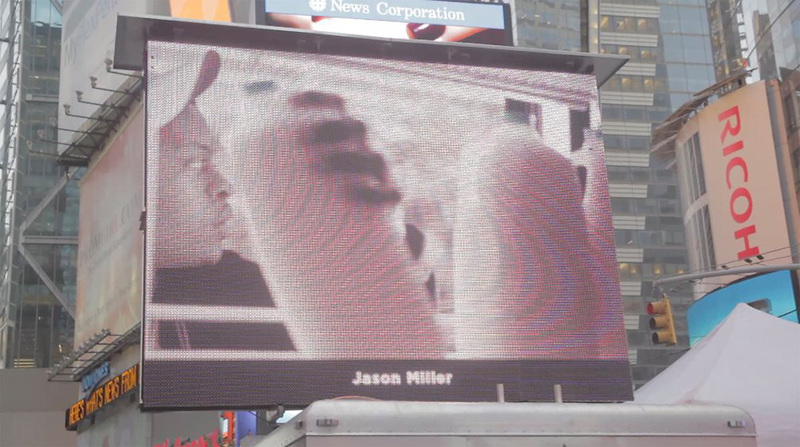 Dairy Diary by Jason Miller featured in Time Square New York, NY, 2012. Dairy Diary is an ongoing straight photography series wherein I insert myself into various grocery store dairy coolers and display cases where products are housed for domesticated human consumption. I photograph human subjects unaware, then approach and fill them in on my project and its goals. Ultimately, Dairy Diary is a series about a universal facet of our existence. It is a unifier that connects us all through the universal platform of a condition that on an individual basis, nevertheless, together we share. Regardless, of ethnicity or economic means, we all have to eat, and to eat we must obtain food. Dairy Diary contains an inherent humor merged with the sincerity and sometimes-downtrodden essence of life. Often, in my Dairy Diary Series, the human subject is dwarfed and isolated by the products, which he or she reaches for on the shelves. To me this references the metaphorical question, which asks if we, ourselves, are not becoming more and more the products.